A Palestine refugee woman receives food assistance at the UNRWA Khan Younis Distribution Centre in Gaza. Following the United States decision to cut back its funding for UNRWA this year by US$300 million dollars, the agency worked to mobilise political and financial support around the globe in order to maintain its operations and continue providing essential services to its beneficiaries. 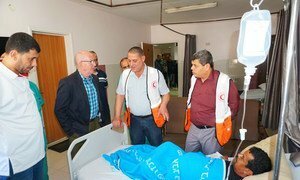 The agency’s emergency assistance programmes are currently critically under-funded in the Occupied Palestinian Territory, said Mr. Gunness. In the West Bank owing to a lack of funding, UNRWA will discontinue its cash-for-work activities at the end of July, he added, and limit the provision of assistance only to the most vulnerable. To address the increasingly “alarming” economic situation in the Occupied Palestinian Territory, the World Bank’s Board recommended on Wednesday that US$90 million be allocated to support economic recovery and job opportunities for Palestinians in Gaza and the West Bank, representing a major increase from its yearly allocation of $55 million. “This significant increase in funding comes at a critical time when urgent interventions are required to prevent renewed conflict and to boost Palestinian economic opportunities and livelihoods”, said Nickolay Mladenov, Special Coordinator for the Middle East Peace Process. “It is particularly vital for Gaza which is on the verge of a total economic and social collapse”, he added. According to the World Bank, about 30 per cent of Palestinians overall are unemployed. 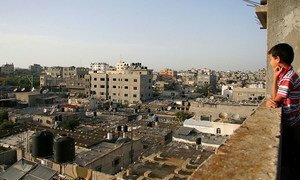 The situation is even more dire in Gaza, where half of the population is jobless and where restrictions on trade and resources are leading to a continuing decline in productivity. “Our assistance intends to provide hope and prospects for Palestinians, especially the youth, and to break the vicious cycle of unemployment, poverty, and instability,” said Marina Wes, World Bank Country Director for the West Bank and Gaza. The new injection of funds, which will be used in partnership with the Palestinian Authority, will be handed over in the form of grants from its dedicated trust fund in the region. A new grant to fund an emergency cash-for-work programme, will provide training and work experience to youth and women with university degrees – 60 per cent of whom are unemployed – to provide social services for the most vulnerable. The funds will also support infrastructure rehabilitation, including solid waste recycling, as well as making water supplies more secure, and renewable energy provision. From arbitrary detentions and deliberate deprivation, to attacks against civilians and forced displacements, the UN High Commissioner for Human Rights, Zeid Ra'ad Al Hussein, expressed “acute concerns” on Monday over the current human rights situation in the Occupied Palestinian Territory.